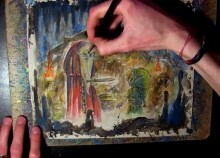 I am always a huge fan of Zelda themed artwork, and YouTube member Adam Scythe recently posted a time lapse video of a watercolor painting of a scene from The Legend of Zelda. The video is a little over three and a half minutes and covers almost two hours of work showing off his skills and recreating the famous scene from Legend of Zelda when the old man gave Link his first sword. The video shows you the whole process from early sketches to completed work. I love stuff like this where you can really see the full creation from start to finish. I think it is especially interesting when you compare say the simplistic nature of the image at twelve seconds to say three minutes when everything is coming together nicely.